Once the principal home of the de Courcys and then inherited by the Percys of Northumberland, Stogursey Castle fell into decay after the Wars of the Roses. This small cottage is built into the ruins of the once towered gatehouse and commands the only entrance to the grassy inner ward of the castle ruins. The thatched roof has 17th-century timbers and there’s an open fire inside. Right below it is the moat, with a 13th-century bridge. This manor house is mainly of late medieval date, with many original features, such as a miniature oratory and a pentice (a covered passage) across the yard. Later additions to the house include Tudor windows and fireplaces in the solar, and the hall roof, renovated in circa 1900. 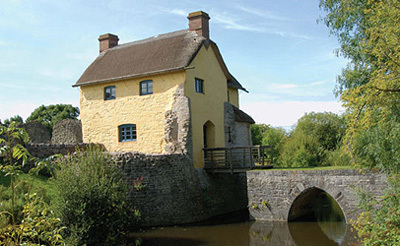 Dating from the 17th century, this stone manor house overlooks the Blackmoor Vale. It has many original features, including a huge inglenook fireplace and slate floor in the breakfast room, and a large oak panelled drawing room, and has recently undergone a sympathetic refurbishment. 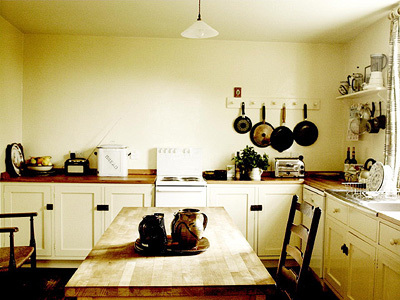 Ideal for large house parties, it even offers you the opportunity to hire a chef/butler/housekeeper for your stay. This stable block was left unfinished after the demolition of Silverton House shortly after 1892. The architect, J.T. Knowles, was commissioned by the 4th Earl of Egremont to erect an imposing block to display his carriages and provide stabling for his horses. 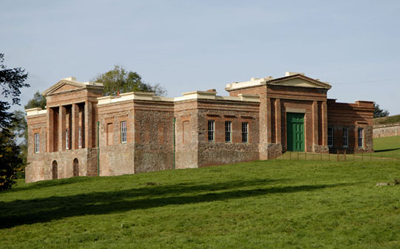 It has now been sympathetically completed and restored by the Landmark Trust. This mellow Elizabethan manor house is situated on the edge of Ottery St Mary in the heart of rural Devon, 10 miles east of Exeter and six miles from the sea at Sidmouth. Built of silvery-golden stone, the present building dates back to the 15th century (the open timber roof of its great hall survives in one range). 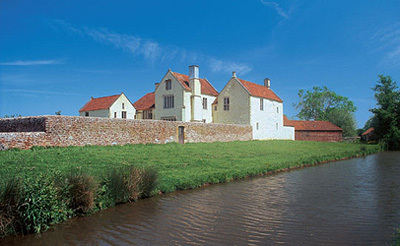 John Haydon, a successful Tudor lawyer, rebuilt the late medieval house in the mid-16th century. Highlights include the fine, chequerboard-patterned internal courtyard with sculptures of Henry VIII and his three children in Classical aedicules, and the long gallery range, which were added by his great nephew, Robert Haydon, who inherited Cadhay in 1587. Thereafter, the house was Georgianised, but during the 19th century it was not a principal residence and was subdivided and let out by the Peere Williams and Hare families. Its rescue from oblivion came in 1909, when a Cambridge academic called W. C. Dampier Whetham bought Cadhay with 400 acres and embarked on a restoration. 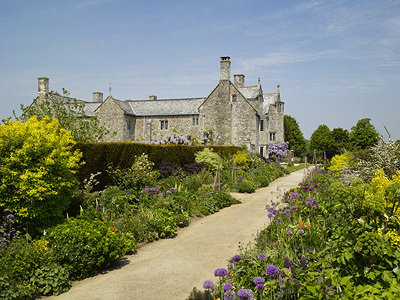 The present owner, Rupert Thistlethwayte, is a descendant of Maj Barton William-Powlett, who bought it in 1935, thereby reforging Cadhay’s strong connection with the Powlett (or Paulet) family from Tudor times. Despite its history, the house feels understated and relaxed, with deep sofas and wood fires; modern comforts without obvious modernisation. Accessible only on foot, the Cabin is a cedar hideaway perched on the edge of a cliff among cypresses and palm trees. A path leads down past an old gun emplacement to the still unspoilt beaches of the Porthkey Sands. 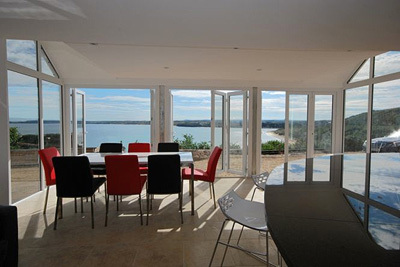 The main living room and mezzanine bedroom have an uninterrupted view over the sea. 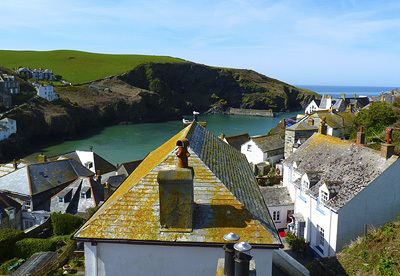 Standing five storeys high above the harbour at Port Isaac, Chicago House is an architectural hybrid. 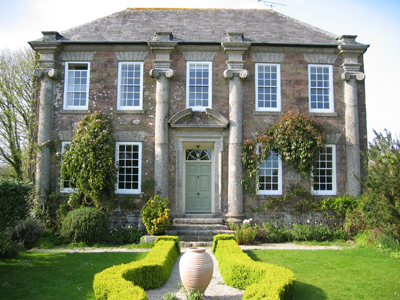 Its slate-built lower storeys date from sometime between the 17th and 18th centuries, while two more of clapboard with bright, high-ceilinged rooms were added over them in the early 19th century, with views over a maze of alleys and roof tops to the rural and marine landscape beyond. The house’s unusual name and colonial-style architecture come from the local man who returned to build it after making his fortune in America. A much older flagged basement room was once used to dry and mend fishing nets. The house is owned by the author A. N. Wilson and his wife Ruth Guilding and has only recently been made available to rent. 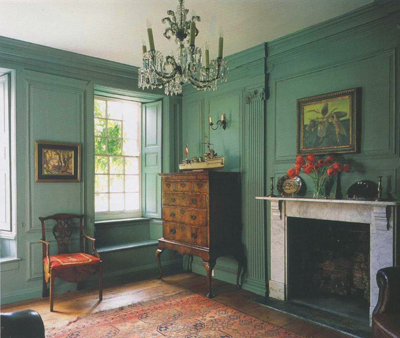 Great Treverran is a beautiful Queen Anne house that featured in Daphne du Maurier’s House on the Strand. A charming example of rustic Classicism, with a five-bay front articulated by tall Ionic columns, the house has been left largely unaltered save for re-painting and plumbing. 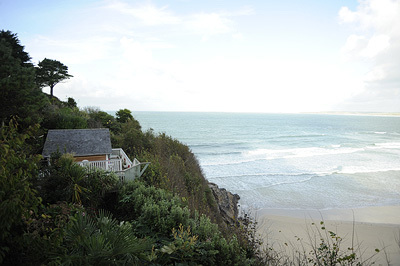 It is owned by the architect Stuart Martin and his wife, the artist Binny Mathews, whose paintings decorate the interior, along with those of her friend Julian Bailey and ceramics by Seth Cardew. There are open fires to cosy up beside in winter, and, in the summer months, guests can make full use of the property’s private gardens and an orchard for camping and barbecues. Energetic visitors can enjoy sailing, swimming, golf, riding and walking; the more contemplative can visit historic houses, fish, dine out or simply lie on the beach.